Altman’s original contract with UO paid him a bonus if ticket sales went above $4M. He failed, so AD Rob Mullens just rolled this into his base pay, then gave him another raise, then in 2017 still more. Last year Altman brought in $2.6M in ticket sales but cost $2.8M just in base salary and a new “retention payment”. Starting in April that increases to $3M. Cheap tickets like that are not too unusual really on Vivid Seats. It’s a resale for folks who have tickets and don’t want them. Here in the premier basketball conference in the country you can pickup weeknight games for $2-3 a seat if you don’t care where you sit. 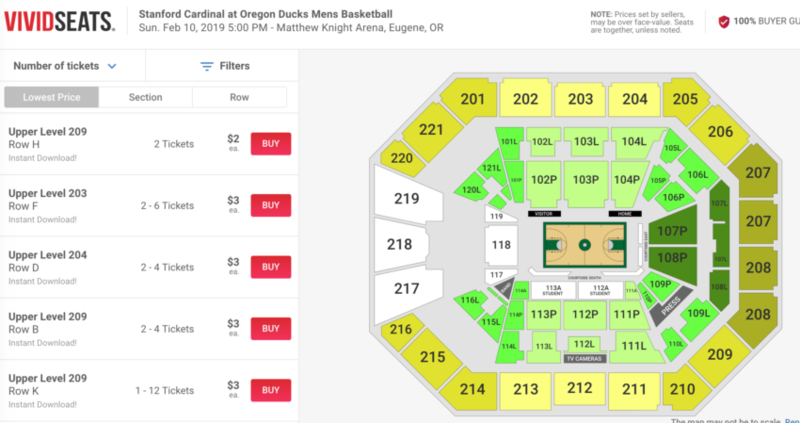 For our rival tickets are often $100 a piece at a minimum. Of course our students get in free and don’t pay athletics fees so there is that as well. $2 is way too cheap to get me to watch a game. Dana would have to pay me quite a bit more to catch my interest. Does Athletics still do their walk of shame from frat to frat begging and offering swag in exchange for filling seats in the arena? Even brief eye contact with administrators seems to inevitably lead to an aggressive “free extra tickets” offer.